Rome has no shortage of green spaces with beautiful vistas but my favorite park has to be the Giardino degli Aranci (the orange garden), also known as Parco Savello. 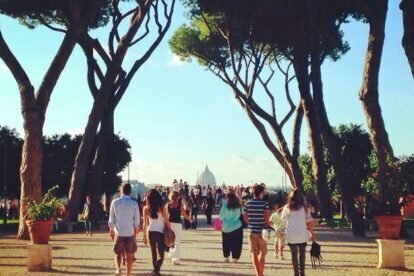 Located just a short walk up from Circo Massimo on the idyllic Aventine Hill, this oasis of peace and beauty has one of the most incredible views of the city, prominently featuring St. Peter’s dome in the skyline. It is a perfect place to visit at any time of the day but it is particularly evocative and romantic at sunset, when the sky slowly changes colors and the city slowly becomes illuminated, one cupola at a time. I love to bring a bottle of wine and some snacks and have an impromptu aperitivo perched on the ledge of the terrace overlooking the river, or in the grass sitting under the eponymous orange trees. Nearby there is also the famous keyhole of the Knights of Malta that has a perfectly framed view of St. Peter’s Basilica which is also worth a visit. The garden is gated so pay attention to the opening hours, which vary by season. In the winter months, the park is open from 7:00am – 6:00pm.